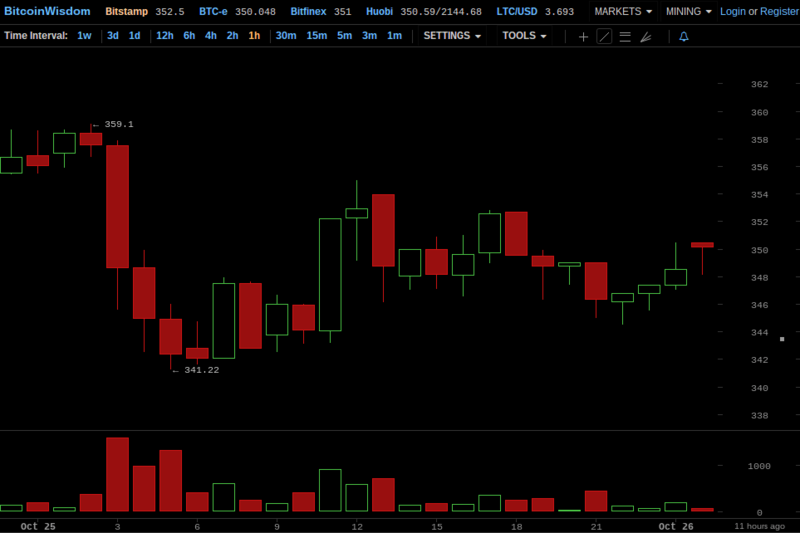 This is the Coin Brief weekly Bitcoin price report for the week of October 19-October 25, 2014. This week was volatile in terms of price activity; at the end of the week, after several days of flat movement, there was significant selling pressure on the market, and the price fell sharply. Overall, the Bitcoin price fell by 11.93% this week. 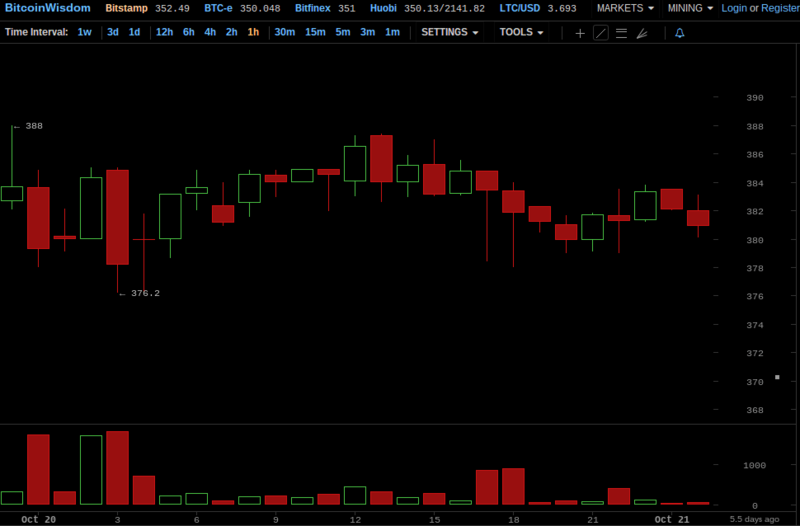 The week started out on Sunday, October 19, 2014, with the Bitcoin price at $394. For the first three hours of the morning, the price remained level. Then, after an apparent pause in trading at 4 AM, the 5 AM hour opened at $388. For the rest of the day, the price hovered between the high $380s and the low $90s. 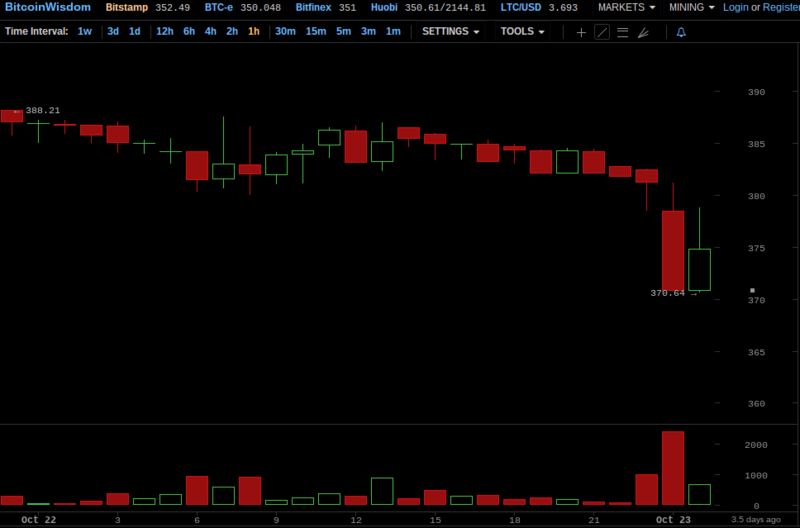 The day closed on the decline, with the price at $383. The 20th began at $383, a 2.79% decline from the start of the previous day. After falling into the $380s on Sunday, the price remained relatively level during the 20th. Aside from some brief dips into the high $370s, the Bitcoin price stayed in the low-to-high $380s for the entire day. October 20 closed at $383 — unchanged from the start of the day. Tuesday, October 21 opened at $383, a 0% change from the opening price of the 20th. This day was also relatively flat in terms of Bitcoin price activity. During the morning hours, the price climbed out of the low $380s range and back into the $390s. After 9 AM, the price fell slightly, and remained in the mid-to-high $380s for the rest of the day. 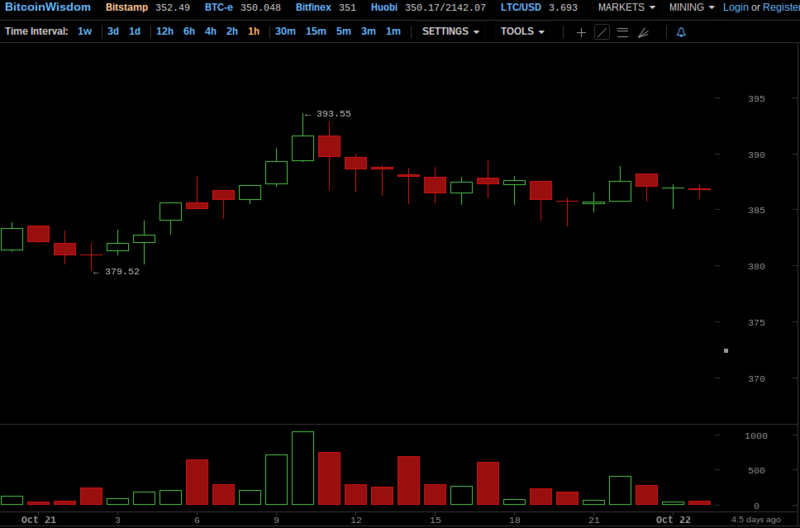 The 21st of October closed at $387. October 22 began at $387 — a 1.04% increase over the opening price of the previous day. 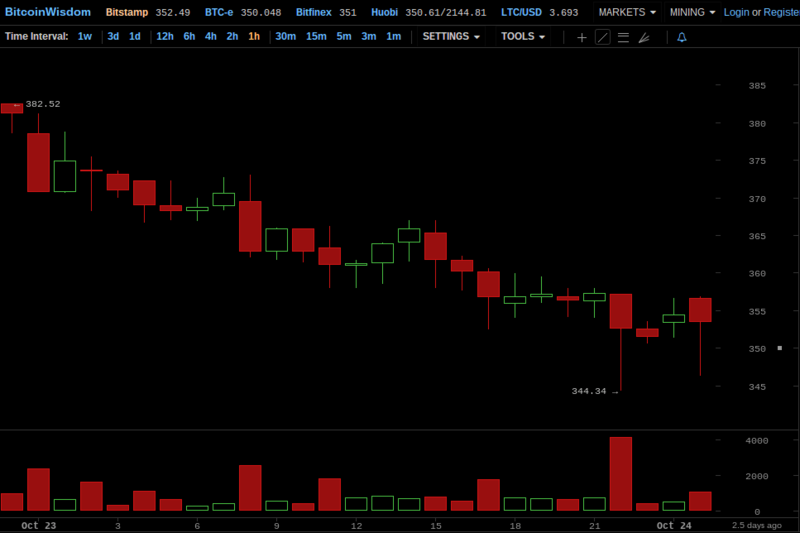 Following the patterns of the last two days, the Bitcoin price activity on this day was flat. The price stayed in the mid-to-high $380s for the majority of the day. However, right at the close of the day, there was a drop from $381 at the bottom of the 11 PM hour to $378 at the top of the midnight hour, which is where the day ended. The 23rd of October started at $378, marking a 2.33% decline from the start of the previous day. The pattern of flat Bitcoin price activity ended on the 23rd; the day opened on the decline, and the price fell steadily throughout the entire day. By midday, the price had fell from $378 at the start of the day to $361. By 8 PM, the price had fallen to $357. October 23 closed out at $353. Friday, October 24 opened at $353, a notable 6.61% decline from the opening price for October 23. The market attempted a recovery from the losses suffered on the 23rd, with the Bitcoin price climbing back into the $360s by 7 AM. However, the potential recovery stalled out at 9 AM, and the price fell gradually for several hours until it leveled out in the high $350s — aside from a relatively sharp drop at 9 PM. 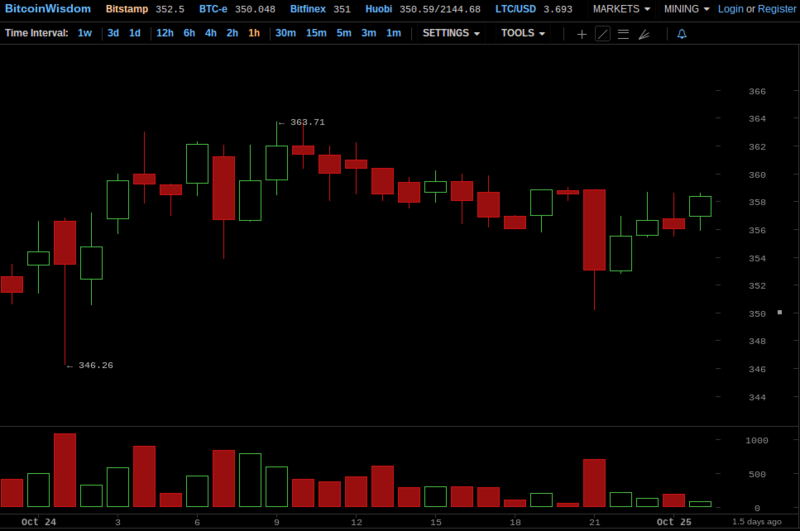 The day closed out with the Bitcoin price at $357. The attempted recovery in the morning hours of the 24th did have some positive effect on the market, as the Bitcoin price on Saturday, the 25th of October, opened at $357 — a modest 1.13% increase over the start of the previous day. The modest gains from the 24th were wiped out, though, during the morning hours of the 25th. At 3 AM, there was a sharp drop from $357 at the top of the hour to $348 at the bottom of the hour, with an hourly low of approximately $345. 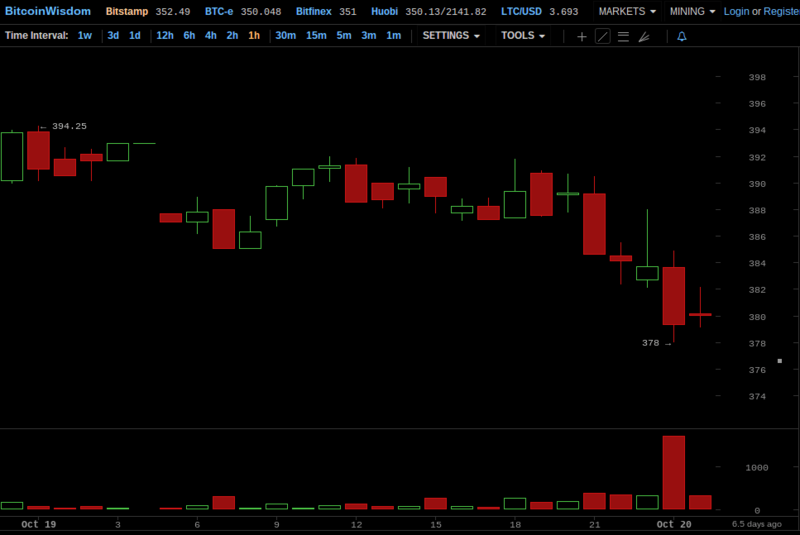 By the close of the 6 AM hour, the Bitcoin price had fallen to $342. At 7 AM, the market began attempting to recover from this sharp drop, and the price had returned to the low $350s by midday. For the remainder of the day, the price hovered between the mid $340s and the low $350s; the day ended at $347 — marking a 2.80% decrease from the start of the day. Last week, we gave a straightforward ceteris paribus forecast for this week: we said that the price would continue moving upward, keeping with the upward trend of the previous week. However, that was clearly not the case in reality, for the Bitcoin price stayed flat for several days and then fell significantly towards the end of the week. However, it may be worth noting that two weeks ago, our forecast had two possibilities. The bearish half of our forecast predicted that the gains made in the aftermath of the BearWhale sell wall was nothing more than excitement and celebratory buying, and would die down. That obviously did not happen in the week immediately following the BearWhale excitement, but it appears that the excitement may finally be getting pushed out of the market now, which would explain the sudden declines that occurred at the end of the week. This analysis borderlines on speculation, though, so this report will not investigate it any further, as the goal of this weekly Bitcoin price report is to provide a descriptive account of price activity during the week. That being said, let us look towards this coming week and make our forecast for the future Bitcoin price activity. Given the significant losses suffered on the market throughout this past week — with the Bitcoin price making and overall decline of 11.93% — we will say that, ceteris paribus (all things remaining equal), the price will continue to fall until it reaches a new resting place. Although, it is possible that this resting place has already been found, and the price will hover around its current level until market valuations begin shifting once more.